One of the best things about my job is leading projects that impact my community. My family lives about a mile away from Byers Road and the new interchange at Austin Boulevard and Interstate 75. So, LJB’s goal of improving the safety and efficiency of the traveling public, and protecting the environment for future generations is never more real than when the public and future generations include your wife and children. 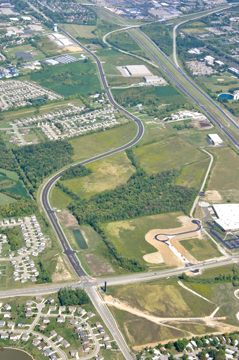 With the new interchange, the adjacent intersection of Austin Boulevard and Byers Road was not far enough away from the interchange to provide adequate spacing. LJB designed the realignment of a 1.3-mile section of Byers Road, which converted the rural township road into an urban five-lane section. This project didn’t come without challenges, but the project team’s creativity helped the Montgomery County Transportation Improvement District keep this project on schedule. 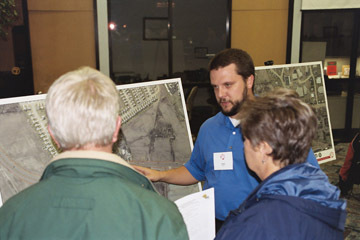 During the design phase, LJB held public and stakeholder meetings to get feedback from the community, including local municipalities, residents and business owners. LJB took that feedbac k into consideration during final design, and significant redesign was completed near Austin Boulevard to accommodate property development. The Byers Road realignment also required off-site wetland and stream mitigation. To offset the impacts, LJB’s environmental scientists built a wetland on nearby Five Rivers MetroParks property and enhanced a stream on city of Miamisburg property.